I bought a Wifi only 32gb iPad Air a couple of months ago and would like to share my impressions on it. For the last year I have been using a Verizon 16GB iPad mini which I loved for many reasons and hated for a few. Before that I had a Wifi only 32GB 3rd generation iPad. So what made me go back to the big iPad? The number one reason I upgraded was that I needed more space. 16GB just doesn’t cut it for me anymore on an iPad. I am fine with a 16GB iPhone but with the amount of magazines, comics, & blueprints (work related) that I have on my iPad, I need at least 32GB. I found myself constantly having to manage the storage on my mini. I also recently got tethering enabled on my iPhone so having a cellular iPad was no longer necessary. If I need data on the go I can easily get it from my phone now. Another reason why I upgraded is that I read a lot on my iPad and the non-retina screen on the iPad mini was really starting to bother me, especially for comics and blueprints. All that being said why not just upgrade to the new iPad mini with Retina display? It was a very tough decision to be honest. The iPad Air and the iPad mini with Retina display are both incredibly good tablets. They both have the same A7 processor, cameras, retina display, battery life, etc. They have never been more similar. It really comes down to just two things. 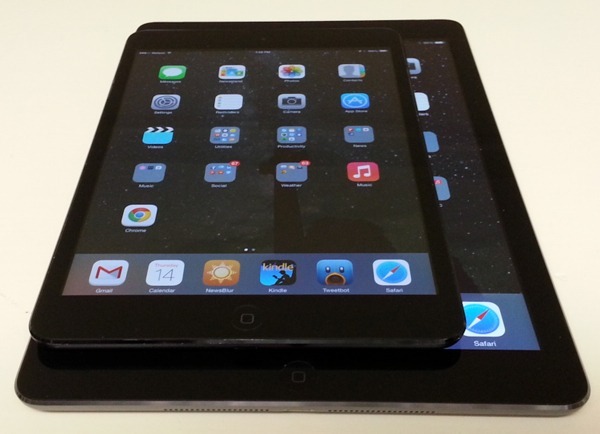 Screen Size – The iPad Air has a 9.7″ display where the iPad mini has a 7.9″ display. 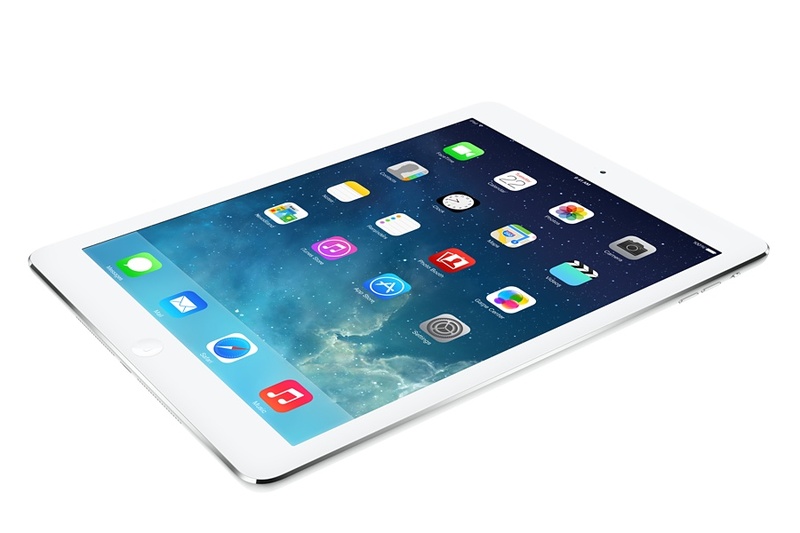 Price – The iPad Air being $100 more than the comparable iPad mini. There were advantages to both iPads for me and I will list them below. The iPad Air is incredibly thin and light with an all new design. It weighs just 1 pound. It is unbelievable how much lighter it is compared to previous full-sized iPads. The 9.7″ Retina display on the iPad Air is ideal for comics and magazines of which I consume a lot of. The larger iPads are much better for typing in my experience. The iPad mini is just not very comfortable to type on for long periods of time. The iPad Air’s battery seems to last much longer in standby than my iPad mini did. The iPad mini is extremely portable. For example, when I had my mini, I would take it to a lot more places as it would fit in my back pocket where now that I have the Air I end up just using my iPhone more. The iPad mini is much better for one handed use. While the iPad Air has lost a significant amount of weight, it is still a two-handed device. The iPad mini is $100 cheaper than the iPad Air. You can basically get twice the storage for the same price by going with the mini. Lastly, I want to talk about accessories. I picked up a blue smart cover for my iPad Air. I like it quite a bit better than the same smart cover that I had on my iPad mini. It doesn’t collapse near as easily. I also picked up a Belkin Shield back cover. I like it fine though it is a tad loose. That is all I have bought for my new iPad but I have been using my Cocoon Gramercy bag with it that I loved using so much with my 3rd Gen iPad. It is still the best bag for an iPad, a few accessories and a phone in my opinion. When it is not in the Cocoon, it is in my bigger but still small bag, the Tom Bihn Ristretto 11″ which I really need to write a blog post on. In conclusion I am very happy with my iPad Air. I am enjoying the large retina screen, the reduced weight, & the bigger storage capacity very much. I would hesitate to recommend it completely to everyone else though. If you are looking to buy a new iPad consider both the Air and the mini and buy the one that best fits how you would like to use it. This entry was posted in Apple, Reviews and tagged apple, iPad Air, iPad mini. Bookmark the permalink.